How in the name of EVERYTHING THAT’S HOLY have we not reviewed these yet? Who’s running this “operation”?! In a country where only a handful of Haribo varieties are available, it’s the responsibility of hard hitting journalists-that’s right, I have a hat with a little yellow piece of paper that says “SCOOP” on it-to report on all of them. And we haven’t done that. And now we feel bad. All better now! Let’s get down to business. Ahh, perfection. Sour Haribo. Sure, it’s not all perfect, but this variety is close to it. 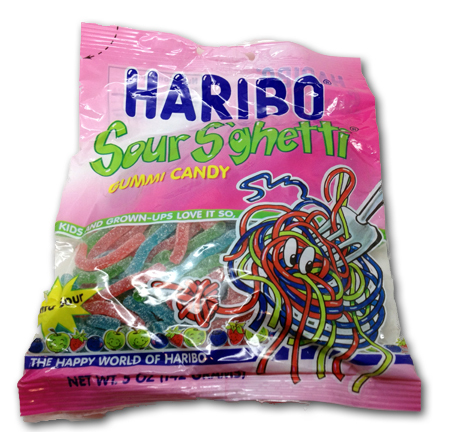 Three flavors (strawberry, green apple and blueberry of all flavors) work together in harmony to bring us a perfect little sour snack. You know it-you love it! Little fun strings of extremely flavorful sour gummies. Having blueberry in the mix is so unique, it really stands out. The best application is to mix these with standard non sour Haribo gummies- then you get a grab bag of the best of both worlds. Or, just scarf down a bag of these on their own-you might get some tummy turmoil, but you won’t be disappointed. Of course, the greatest aspect of these is that you can get them all over the place in brick & mortar shops, and plenty of places online. If for some reason you’ve never tried these, shun yourself. After the shunning, pick up a case for good measure, and then tell your friends you were just kidding about never trying them, and then get angry at them for not stopping your self-shunning. They’ll be confused, much like you are now, and likely offer you money. My mouth is watering just thinking about these. This reminds me…Dodie saw KitKat’s in Japan that were green tea flavored & lychee flavored. I’ll have her pick you up some next time she’s there. 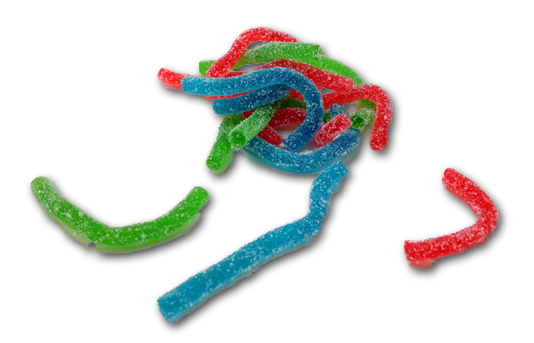 Thanks for making me ‘jones’ for sour gummies. Jerk! I snorted these last night.